More importantly, the birthday boy signed Delicious after tasting them–ah, the way to a foodie mom’s heart! If you sign with your baby, I highly recommend working on Delicious from the minute they start solid foods. Sure, More and All Done are practical, but your job satisfaction rating will soar the first time you get a rave review like this. While I was willing to experiment with the sugar in the cake, I used regular organic sugar for the meringue I made instead of buttercream frosting, once again avoiding dairy. (Here’s my favorite meringue recipe.) I added a little lemon extract instead of vanilla, set some aside for the birthday boy’s personal cupcake and then started squirting in the blue food coloring in with abandon. It took a lot to get it to a reasonable shade of blue. I used far less of the food coloring on the shredded coconut, which thankfully took the color very well, because my original hope to pipe the meringue with a grass tip failed due to it being ooey, gooey meringue. 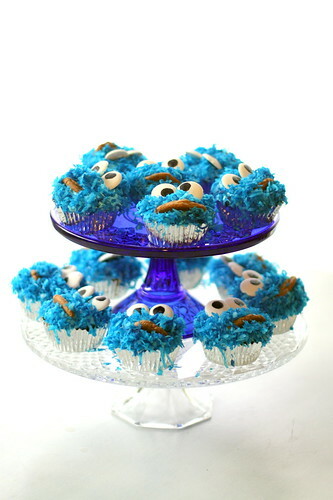 I cut into the cupcake to make room for the third of a cookie that each monster held in his mouth, pressed the cut up cookie in point down, and piped blue meringue all over the top of the cupcake and around the cookie. Then I sprinkled and pressed the coconut on until very little of the lighter-colored meringue showed. The eyes were just white coating chocolate discs I painted with black food coloring and then arranged so as to approximate true googly-eyedness. 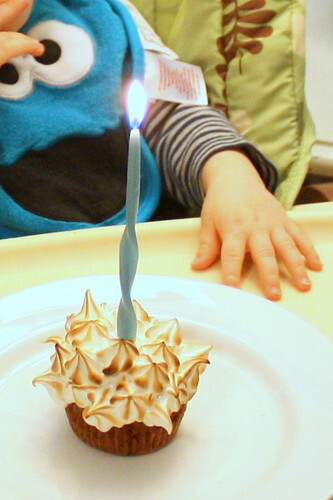 As for the birthday boy’s cupcake, I used a star tip to pipe wild points jutting out in all directions from the top and torched it–much like what I did for these insanely delicious cupcakes–finishing the presentation off with a tall, twisted blue candle. No need to feed food coloring to the kid just yet! Plus it was amusing that it was all the adults at the party who had blue tongues and teeth. 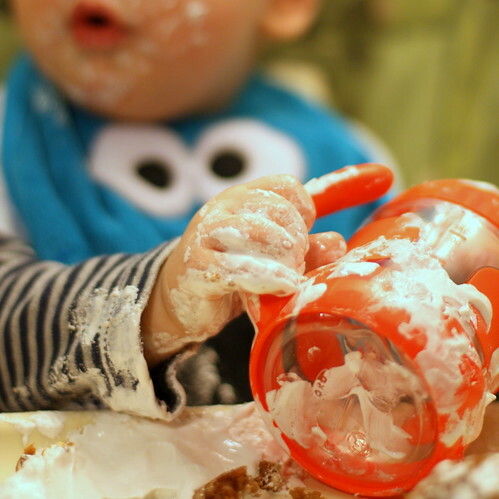 But don’t worry, he got properly messy in his own way. these are so fun and creative! These are AMAZING! I want them! OMG, those are the cutest things ever! Way to go. My nephew turns one next month. 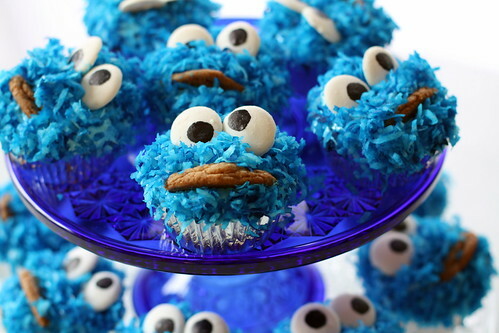 I would love to make him these. Oh dear! And here I felt bad not having come up with the idea myself! 😉 Glad you like them, though. These are brilliant! I love them! I love these cupcakes, they are by far the best ones out there and I have been looking for weeks. I liked that you substituted for your own diet needs and they still worked and that they are meringue. My whole family hates buttercream! 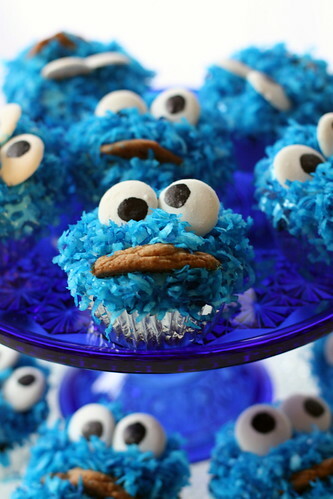 I am making them tomorrow for my daughters 1st birthday on saturday. I wasn’t sure to make them but she went crazy over a cookie monster cake she saw at the grocery. I am making gluten and dairy free organic cupcakes. We don’t have any food intolarences but I just prefer it for our family! I have a few questions… How many cupcakes do I cover with the 8oz/1 lb mixture of the recipe? Can I just whisk it to consistency instead of putting it in a mixer? I thought the sugar needed to be added slowly as you whisk in order to rise but it calls for everything to be mixed together, is that only for mixers?! And finally, how do I store them for the next day?! I too will leave one without coloring for her…great idea!!! Awesome job on the cupcakes, Jessica! Thanks so much for stopping by my blog.